Autumn and winter weather bring fun holiday adventures, surprise guest visits, and general commotion as this busy time of year comes into full swing. As you anticipate all the events that will occur within your rental property, guest and tenant safety should be at the forefront of your mind. While the cold seasons can bring fun for everyone, snow, ice, and rain can be a dastardly combo for the errant foot-traveler attempting to get inside from a storm. Slips and falls don’t have to be a part of your winter and autumn seasons, however. 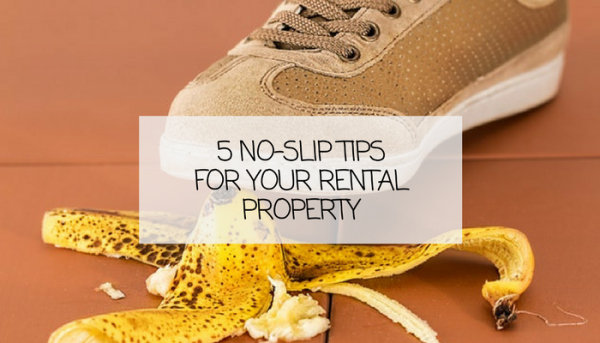 These quick slip prevention tips can keep your tenants safe, and prevent you from being found liable for an injury. Railings on decks, porches, and stairways need to be secure to provide optimum safety. Remember that wear and tear can occur throughout the year, so be sure to verify the stability of any railings this season. They should be strong enough to support a person who may have lost their balance on an icy or wet patch. To further help your renters’ stability as they’re coming to-and-fro, take the time to add texture to your walkways and entrances that will make it easier to travel across in inclement weather. This slip prevention technique is especially important in areas with lots of snowfall or rainy areas. Trim bushes whose growth could impede your walk. Remove or mark tree roots in your walkway. Crunchy autumn leaves can turn into a slip hazard when wet; instruct your maintenance crew to keep sidewalks and entryways clear. Regardless of what other slip prevention techniques you implement, if your walkways are covered in mulching debris, it’s highly likely your tenants could slip or fall. Fill in any holes that may be hidden from the glance of a rushing person. 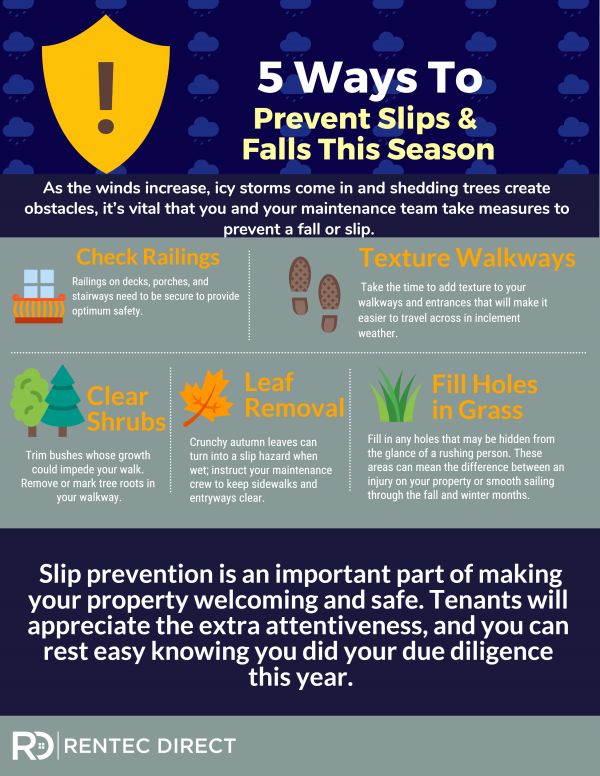 These areas can mean the difference between an injury on your property or smooth sailing through the fall and winter months. Remember that injury prevention is vital any time of year, but during the inclement weather that autumn and winter can bring, it should be a priority. Slip prevention is an important part of making your property welcoming and safe. 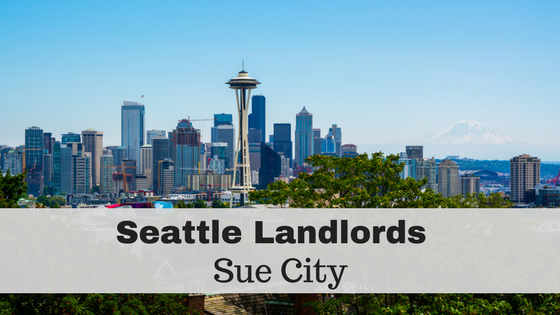 Tenants will appreciate the extra attentiveness, and you can rest easy knowing you did your due diligence this year. Guess what!? You are one of the first to know that we are in the process of releasing a mobile app for both Android and Apple products! 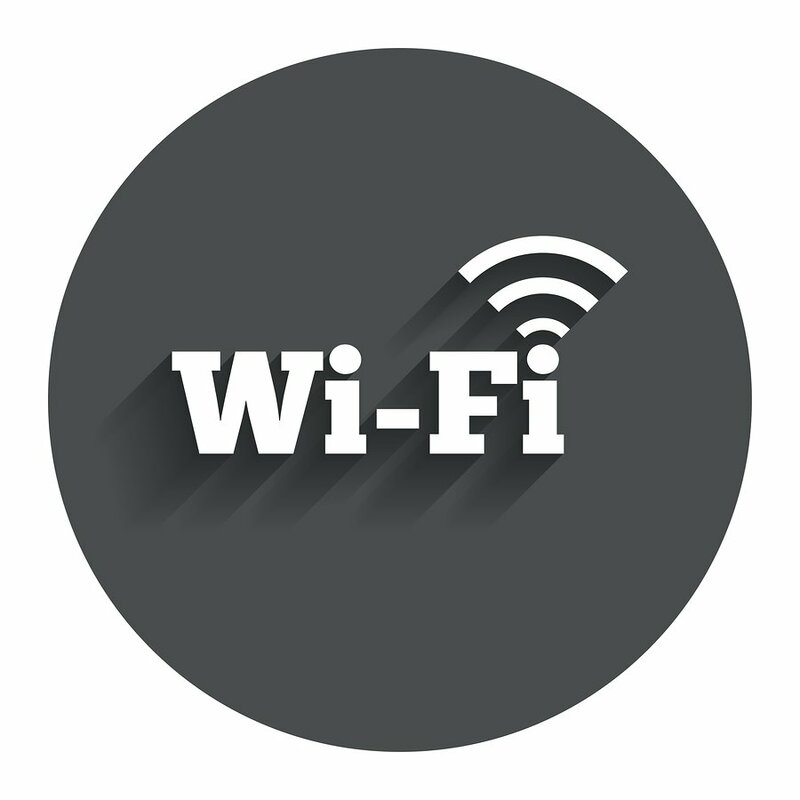 The Rentec Direct Resident Connect app allows renters to submit maintenance requests and pay their rent online. There is also a separate Owner Connect app, for property managers to share with their owners to view property performance, reports, and statements. We haven’t officially announced the apps yet, but they are available for you to use today. Check out them out in the Google Play Store and Apple App Store. Keep in mind that only tenants can log into the Resident Connect app and only owners set up under a PM account will be able to log into the Owner Connect app. 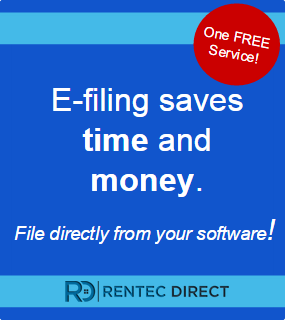 Contact success@rentecdirect.com for more information. Hi Brentnie! Thanks for sharing the blog. I am sure many landlords will thank you for writing on fall-prevention houses.